Cal Mare’s Rigatoni All’Amatriciana recipe swaps out the guanciale in a traditional amatriciana for yellowfin, creating a flavorful pasta “of the sea”. Cal Mare is a concept that has been close to Chef Adam Sobel’s heart and soul for many years and is largely inspired by his journey throughout Italy where he visited the coastal regions of Lazio, Campania, Sicilia, and Puglia, as well as the hillsides just outside of Rome. 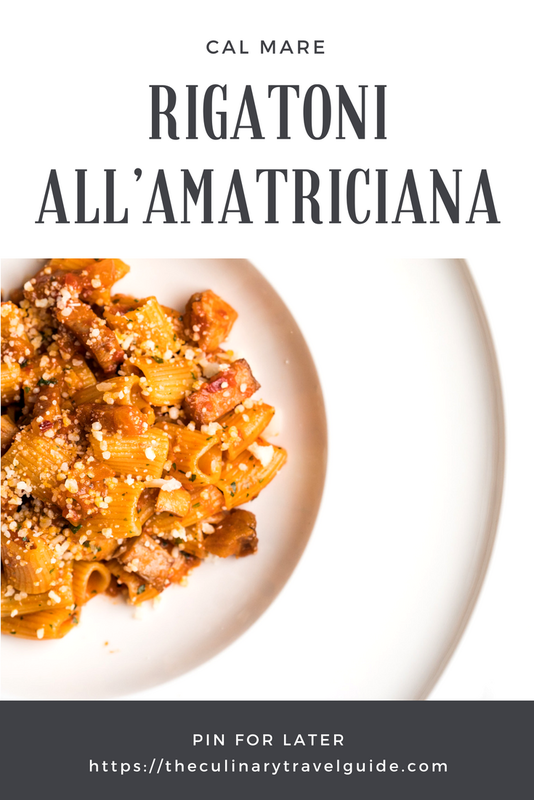 One of the most popular Roman pasta sauces is amatriciana, a rich and flavorful pasta sauce made with tomato, guanciale (cured pork jowl), red pepper flakes, and plenty of grated Pecorino cheese. Chef Sobel fuses coastal seafood with fresh pasta by replacing the guanciale in the traditional recipe with yellowfin. The result is a flavorful pasta of the sea, Rigatoni All’Amatriciana Di Mare. Make a sachet of the bonito flakes using the cheesecloth and tie with butcher twine. Bring a large pot of salted water to a boil, drop the pasta and cook for 6 minutes then drain. In a large non-stick skillet, place 4 tablespoons olive oil and heat over medium-low, add onions to the pan, sweat until soft, about 3 minutes. Add the tomatoes and crushed red pepper, then add the sachet, and simmer for 3 more minutes. Adjust the heat to medium, add the pasta water at the end and stir to reduce. In a small non-stick skillet, add the grapeseed oil and heat on medium heat until almost smoking, add the tuna and cook one side then the other, 2 minutes each side, or until slightly browned. Remove and drain on paper towel. Reserve. Remove sachet and discard. Taste the sauce for seasoning, adjusting as needed then add the cheese and parsley to incorporate, prior to adding the pasta, so that the noodle cooks to al dente within the sauce. Add the tuna belly to the sauce. Try not to agitate the pan too much, to keep the integrity of the fish so that there are good sized chunks in the finished dish as the contents are gently combined and the cheese begins to melt. Portion into warm bowls and serve hot. Get More Recipes Like This Direct to Your Inbox!